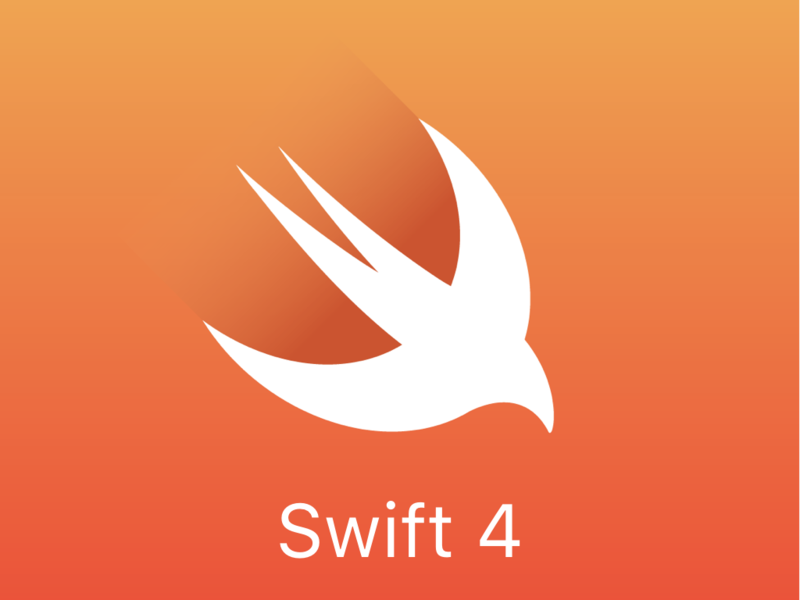 In this blog I would like to give insight in the amount of code breaking changes that will be introduced in Swift 4. Also, I will demonstrate how you already can work with Swift 4 in the current Xcode 8.3.2. If we would summarise all implemented Swift 4 proposals, we would (as of 31–5–17,) come up with the following list. 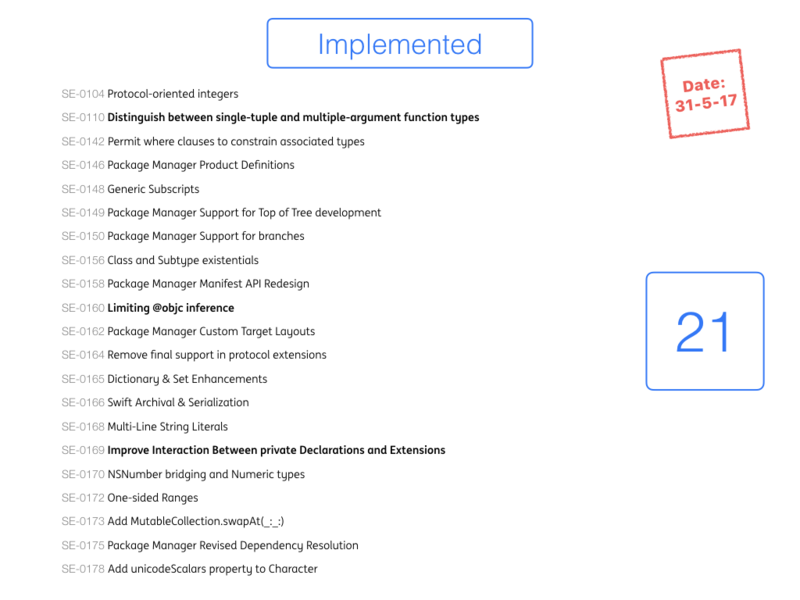 The proposals that are highlighted in bold are proposals that introduce source breaking changes in Swift 4. Let’s dive deeper into each of these proposals. With this proposal, you now have to manually expand tuples from the now-single parameter. Let’s explain using a example. I declared a tuple within a array. Now I want to loop over every tuple in the array and print the last name. Let’s do this in Swift 3.
print(last) <strong class="markup--strong markup--pre-strong">// "den Hollander"
The ‘first’ and ‘last’ variables are expanded from the tuple by the Swift 3 compiler. This is very helpful and readable. Now let’s do the same within Swift 4. The reason this doesn’t work anymore is because in Swift 4 you have to manually expand tuples from a single parameter. You can do the following to fix this. print(name.lastName) <strong class="markup--strong markup--pre-strong">// "den Hollander"
Still the question is raised as to why this change was introduced. This question is answered by Joe Groff, Swift Compiler Engineer at Apple. The slushiness around arguments-as-tuples is one of the major sources of bad type checker performance. I think that although this change may result in better type checker performance, this will lead to worse readability of the syntax. in Swift because they work with Objective-C under water. so the compiler can work more efficient. An simple example for adding this annotation where foo() is accessible in Objective-C is the following. Note: A migration plan is provided in this proposal. This plan gives a 3 step workflow that can help in some projects. in combination with using a extension. access level to make it accessible to a extension of the same type. Let’s explain this using examples. In Swift 3 you could have the following program. error would then follow. Changing the signature would resolve this issue. Would it be possible if I could already check my current codebase against Swift 4 changes? Yes, you could! 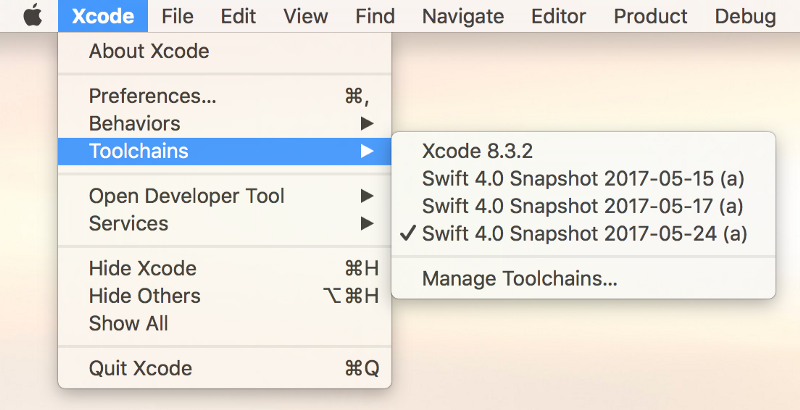 You only need to download and install the latest Swift 4.0 snapshot and select the installed snapshot in the toolchain menu in Xcode. The following image shows where the toolchain menu is located. When the toolchain is changed, you can now start your project and try to build it with the snapshot! A snapshot is of course not the final version, but there are already a lot of proposals implemented of which you can create a rough estimate of the amount of work that comes ahead of you. Doing so, you know what the impact of this new Swift version will be on your existing code base. Follow me on twitter to get updated about new blogs.